Doped up on the 8 worldly concerns?! This continues from this article, In praise of integrity. And talking of pedestals, a good friend of mine went to the same high school as John Cleese, and told me this tale about him. In front of the school is a tall pillar, on which Field Marshall Haig had stood for almost a hundred years, until parents and guests turned up to graduation one year to find footsteps leading from the pillar to the building and back again… Even famous commanders can’t live on a pedestal, but have to get down to use the restroom sooner or later. If we have been practicing Dharma for some time but cannot feel any of its benefits, the reason is that we are not yet practicing pure Dharma. What’s more, as the scriptures say, the higher we are in the tree of ambition, the thinner the branches, and the further we have to fall. You do know this is not it? “That was good, but you do know this is not it?” The words spoken by his friend to a prominent teacher in my Buddhist tradition, the New Kadampa Tradition, after he had just finished teaching at a large Festival. The teacher was telling me this, saying how glad he had friends around him to keep him real so that he did not become “doped up” on praise, love, or prostration mudras. Teaching success is no substitute for spiritual success. We were also chatting about what happens when we become so unused to criticism by dint of a high position that, if we’re not careful, it becomes harder and harder to handle criticism when it does come our way – clearly the opposite of what is supposed to happen for a Kadampa! Praise etc doesn’t help us while we have it, and once we’re off our pedestal it quickly dries up as well. If we have come to depend on it we’re in trouble, and if it has become part of our self-image we’ll have to pretty much reinvent ourselves. I believe that the 8 worldly concerns stop spiritual progress. It is easier to make progress when you feel normal, like everyone else, rather than special. Lucky, yes, perhaps, but special, no. Pride drives a wedge between us and those we are trying to help, which is one reason there’s so much emphasis on humility for Bodhisattvas. Your main job is practicing Dharma. Everything else will follow naturally from that. That has been true for me on many levels, and it makes more sense to me with each passing year. My main job is being a practitioner first and whatever else second. If we feel that our job is inherently worthy, and feel carried along by it, this can make us lazy in training our minds and undermine our inner development by allowing worldly concerns to creep in. And the worst part? We might not even realize this is happening, while the precious years for practice pass us by. There are numerous stories in the Buddhist scriptures of people being expelled or otherwise leaving their high or cushy positions in the monastery or society to go off on their ownsome to gain realizations, and to me these are an inspiring example of the need to let go of the eight worldly concerns even whilst we stay amongst others. It really doesn’t matter whether or not we are flavor of the month. It does matter whether or not we stick to our principles of compassion and wisdom. And if these are our principles, rather than the 8 worldly concerns, this allows a lot of room for flexibility in accordance with the changing needs of others. For example, Geshe Kelsang has shown extraordinary month-by-month flexibility in adapting Buddhism from the reclusive monastic situation in Tibet to the connected, transparent modern world without sacrificing his principles and seemingly caring not a jot for the 8 worldly concerns. Don’t you think this means not just in general, but also on a rigorous daily basis, knowing what our mind is doing and taming our own delusions before we go trying to tame others? The 8 worldly concerns shrink our world and I think can make us institutionalized if we take our small world a little too seriously — whether this is the world of our family and friends, our business or workplace, or even our place of worship. To expand our world again we can remember that we’ll be leaving this life soon; we have at most a few hundred months left before we find ourselves in our next life. Remembering death and impermanence is the antidote to the 8 worldly concerns. Can you remember back to this time last year, what were your overriding concerns/anxieties/things you really wanted? Are they the same today? Fast forward to this time next year, will the concerns/anxieties/things you really want today still be the same then? If the answer is no, as it pretty generally is, I find this helps me let go of worrying about whatever I happen to be currently worrying about, for it seems a waste of mental energy! We can relax instead into what endures year after year, our spiritual journey. Wisdom: Everything is moreorless deceptive while we have ignorance – things are never exactly as they appear, and when we have strong delusions or agitated minds, such as the 8 worldly concerns, we can be sure that what we are seeing has very little resemblance to what’s really going on. Therefore, we need to rely on the wisdom of emptiness to do away with the false appearance of inherent existence, understanding that the things we normally see do not exist. 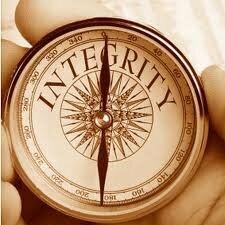 I count myself lucky to know people with lots of integrity, who’re trying their best to change for the better, every day. They are flexible, but not blown about by the changing winds of how things are done or not done this week, month, or year, at the expense of common sense or indeed basic human kindness; they are not sticklers for rules for rules’ own sake. They are more inspired by the enduring rules of wisdom and compassion. We can always find our way if we stick to wisdom and compassion. Thanks for this its one of the topics I wanna see more. I find to keep pride at bay even if a high teacher is simple. What you do is have a non buddhist circle of friends ie a social meeting group. Go there once a week and meet them as equals. It could be doing a few hours in a charity shop once a week or a group of elderly who you play a card game with. Then you will see if you feel uncomfortable without the speical status or if you have any sense of being superior. They will not stand for it and they will kick your arse if you dont show them respect. Its very helpful & helps perspective. I get criticism every week now its awesome! When people are swooning as they ask how long Ive been a Buddhist I dont feel special or important as I tell them its been 22 years as Im getting my arse kicked a lot outside the centre! Non Buddhists challenge me, my patience, my self importance & break the mould of my small world showing me that other peoples worlds matter too. I think the world revolves around the NKt when my ego is dominating but I havent had that for a while now. I see lots of worlds now & mine is just one of many. Thank you Luna! Much applause coming from me (to you) for writing this article. Just what I needed to read — the 8 worldly concerns can sneak up on us! Dharma practice bringing good results, then one (or two, or three, etc.) of the 8 worldly concerns come along and your practice will just ‘clog’ up! This has been my experience. So, just how to I go about abandoning these wordly concerns in pratical terms? Remembering death is a good place to start… you can see what Geshe Kelsang writes about how death helps us abandon the 8 worldly concerns in Joyful Path. Plus I give a few pointers in the article, relying on compassion and wisdom. I find this series of posts really helpful. I’m very interested in the idea of authenticity in general, but don’t tend to think of pretentiousness specifically in terms of spiritual practice. I think when we’re pretentious it’s pervasive, and then is evidenced in our spiritual practice. Makes sense, right? If we can’t even admit who we are in a worldly sense – maybe we’re not as clever and strong, or dynamic and interesting as we’d like to think – we don’t stand a chance in spiritual practice, where all of our most painful limitations should be exposed and dealt with. We’ll do things that aren’t kind or even decent and explain them to ourselves as being rooted in something virtuous, when in fact our real motives are quite base. And this all gets even more complicated when we think of its implications in group practice, where pressure to conform can’t but encourage a certain amount of inauthenticity. This is very good stuff to bring up and talk about for all of us, I think. The last comment (Are you doped up on the 8 worldly concerns) is my favourite so far, because you’ve come out and said things that needed to be said for me. Thanks so much for sharing what Geshe-la said to you, that practice is your main job, not teaching. I’ve been mulling over the 8 wordly concerns and how they pervade my life. This article gave me many new ways to look at my mind and cultivate a more positive view. Thanks. I’ve been struggling with how to help other people because I find that most people aren’t ready/willing to hear advice from a dharma perspective. The quote you give – “Your main job is practicing Dharma. Everything else will follow naturally from that” is exactly what I needed to hear. To remember to just focus on practicing myself because in the end that will help other people. Thank you! Thanks Luna, we live in such a full of distraction world…we should be aware and not allow ourselves to be consumed by all that constantly distracts us, I enjoy a lot this article, because your arguments are very real and you give us a lot of practical tips. Thanks for reminding us do not take this brief life so seriously. but also this little person who now we are dreaming to be, so seriously … let´s start waving the two wings that take us out of Samsara; compassion and wisdom …. let’s shake the dust that we’re late. Hi, the eight worldly concerns basically tie us down to a life that is deceptive in it’s pursuit of happiness, I suppose, when viewed through the Dharma mirror. Right in the centre is the deceptive inherently existent ‘I’ (me me monster) that thrives on it’s feeling of specialness, attractiveness, cleverness, possessions and reputation. It’s like that sandcastle easily swept away by the smallest tide of the sea. Such a life can be focussed myopically on ourself alone so literally it depends on a narrow mind slavishly obeying and defending the ‘ego.’ ‘The puppet on a string’ analogy is aptly descriptive. We think the worldly concerns give us freedom from suffering but they are mistakenly the source of even more suffering! I never suffered so much as when I was defending ‘I’ and ‘mine’. Just what I needed to contemplate this very day, (and every day actually!) till we are free! Thanks Luna! What an apropos post! I have just been struggling with this very issue and was planning to bring the subject up with my teacher at next week’s class. To make a long story somewhat shorter, in the end I had to face facts: I was meditating in order to bring good things to–guess who!–me. A clear case of using dharma for personal gain. But, how do we stop wanting what we want? It can’t do any good at all to simply pretend we aren’t caught up in the 8 worldly concerns when we obviously are. Next Next post: Can we make sense of the senseless?